The six National Outdoor Badges recognize a Boy Scout, Sea Scout, or Venturer who demonstrates both knowledge and experience in camping, aquatics, conservation, hiking, riding, or adventure. Scouts earning the National Outdoor badges have demonstrated that they are knowledgeable, safe, and comfortable in the outdoor activity covered by the badge. When a Scout excels in outdoor participation, there are awards to show for it! This program, conceived by the BSA's National Camping Task Force, includes a series of six badges designed to recognize a Boy Scout, Sea Scout, or Venturer who has exemplary knowledge and experience in performing high-level outdoor activities. The award consists of up to six emblem segments positioned around the perimeter of a beautiful center emblem. All are embroidered in full color. The segments represent six areas of emphasis: Camping, Aquatics, Conservation, Hiking, Riding, and Adventure, with rigorous requirements to earn each segment. The center emblem features an outdoor scene with fleur-de-lis and the words "National Outdoor Awards." In order to earn one or more of the National Outdoor Badges (and/or the gold or silver devices), he or she must complete the following requirements. 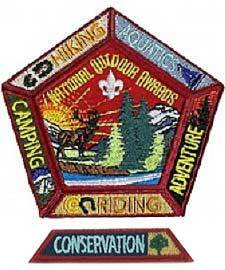 Note: The large center badge shown above is awarded when a Scout earns the first of the five badges described below. A spreadsheet for tracking these awards may be downloaded by clicking here. A gold device may be earned for each additional 25 nights of camping. A silver device is earned for each additional 100 nights of camping. Venturing Ranger Land Navigation core requirement. A gold device may be earned for each additional 50 miles hiked, backpacked, snowshoed, or skied as outlined in requirements 2 and 3. A silver device is earned for each additional 200 miles of hiking. Complete the requirements for the Swimming merit badge and either Lifesaving merit badge or Venturing Ranger Lifesaving elective. (For Sea Scouts, swimming merit badge requirements are an Ordinary rank requirement, and lifesaving merit badge requirements are an Able rank requirement). Complete the requirements for at least one of the following: Canoeing, Fishing, Fly-Fishing, Kayaking, Rowing, Scuba Diving, Small Boat Sailing, Water Sports, or Whitewater merit badges or Ranger Award Fishing, Scuba or Watercraft electives. Complete at least 25 hours of on-the-water time, applying the skills that you learned in the merit badge or Ranger elective. A gold device may be earned for each additional 25 hours of aquatics activity listed in requirement 5. A silver device is earned for each additional 100 hours of aquatics activity. The youth may wear any combination of devices totaling his or her current number of hours of aquatics activity. A gold device may be earned for each additional 25 hours of conservation work. A silver device is earned for each additional 100 hours of conservation work (for example, the first silver device is earned at 125 total hours of conservation work). A gold device may be earned for each additional 100 miles of riding set forth in requirement 3. A silver device is earned for each additional 400 miles of riding. Items 3a–g may be repeated as desired. A single activity that satisfies multiple items in 3a–g may be counted as separate activities at the discretion of the unit leader. Similarly, a single activity that doubles an item in 3a–d may be counted as two activities at the discretion of the unit leader. A gold device may be earned for each additional five activities. A silver device is earned for each additional 20 activities. The Scout may wear any combination of devices totaling his current number of activities. (and for the National Outdoor Achievement Medal).